The preparatory program at Washington State University is one of the most comprehensive in the nation and offers many opportunities for students. Your health professions specialist can help you explore opportunities for research, leadership, and industry experience. Your pre-vet specialist will assist you in preparation for your professional exams and help you produce and submit a complete application to the veterinary programs of your choice. We encourage students to meet with us at least once each semester. We advise and support students from all majors and continue to provide support to students after they complete their degree at Washington State University. Pre-Veterinary study is not a major in itself. It is a preparatory track that can be incorporated into any major. As an undergraduate student, you may choose any major that you are passionate about and still fulfill the prerequisites necessary to qualify for a four-year veterinary medicine program after you graduate. 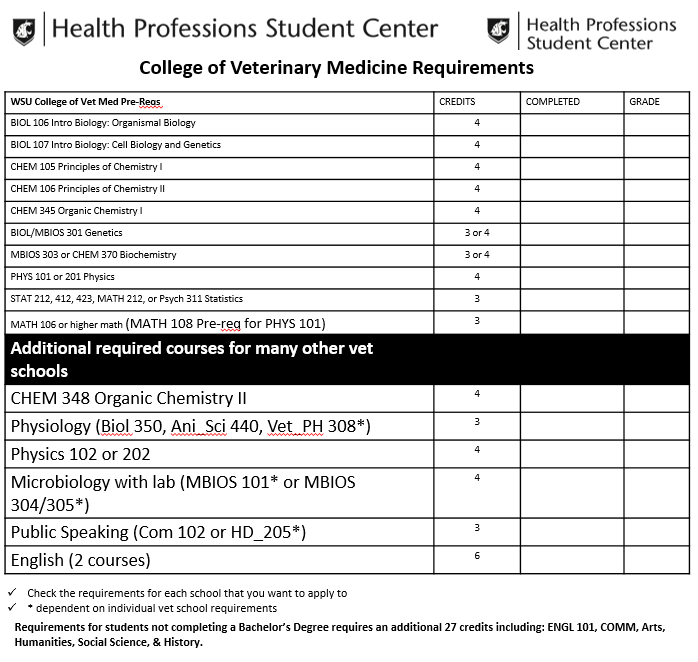 Highly motivated and uniquely qualified individuals may gain early acceptance (pre-admission) and early entry (admission) into the professional veterinary medical program. In cooperation with the WSU College of Veterinary Medicine, the WSU Honors College offers the Pre-Admit Veterinary Medicine Program and the Department of Animal Sciences offers the Combined Program in Animal Sciences and Veterinary Medicine. These programs share the common goal of identifying and retaining highly qualified students early in their undergraduate programs by offering an opportunity to gain pre-admission into the professional program at the end of their first undergraduate year. 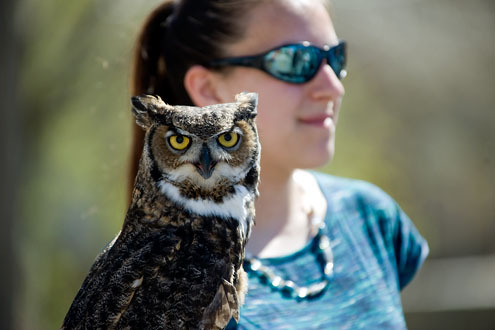 The Honors College and College of Veterinary Medicine offer an Honors Pre-Admit Program. Successful completion of this joint program takes seven years and results in the attainment of a BS and a DVM. A similar seven year program is offered by the Department of Animal Sciences and College of Veterinary Medicine. Selection is by invitation only and requires a minimum entering high school GPA of 3.6 and significant experience with food-producing animals. Successful completion results in a BS in animal sciences and a DVM. 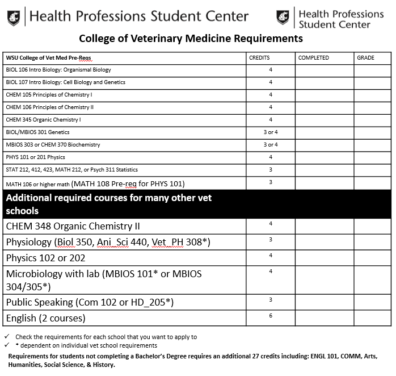 Veterinary schools have different requirements. Please keep in mind that the requirements listed here are a general road-map for student success, and not a prescribed plan for a specific program. Students are encouraged to check individual school websites for specific requirements. If you have questions about the admissions criteria or pre-requisites for a specific program, please make an appointment with Becky Jewell on our homepage. Admissions committees will consider your cumulative GPA, science GPA, last 45 semester hour GPA, prerequisite GPA, grades in upper division science courses, as well as course load per semester. Does this mean that you need a 4.0? No, it doesn’t! Many vet schools have no minimum GPA required to apply. Veterinary schools are looking for well-rounded students. They’re looking for future leaders. You can make yourself a better candidate by getting good (or great) grades as well as experience and leadership skills. Most veterinary colleges require the GRE Revised General Test. GRE scores must be submitted to the veterinary colleges of their choice. Students are required to submit at least three letters of recommendation, but may submit up to six. The criteria for these letters change depending on the school, but generally at least one of the letters submitted must be from a veterinarian. Most veterinary schools do not provide a minimum, but many recommend approximately 200-500 hours of animal experience (any work with animals not supervised by a veterinarian) and 200-500 hours of shadowing/veterinary experience (work supervised by or in observation of a veterinarian). Note that obtaining high quality, diverse (small & large animal) shadowing experience is more important than merely accumulating hours. A strong history of volunteer activity is an indication of the applicant’s desire to contribute to society; a major component of becoming a veterinarian. A good place to start looking for community service opportunities is at the Health Professions Student Center. Your Pre-Vet Specialist, Becky Jewell can point you to opportunities in the Pullman area. Information for prospective students: Contains links to information about preparing for vet school, the application process, and resources available to WSU vet students. Important dates: Important deadlines for submitting the various components of the admission application. Cougar Success Resources: List of helpful services available to WSU students free of charge. AAVMC home page: An organization dedicated to preparing the veterinary workforce for serving society with excellence. Sources of funding: Provides guidance on how to get help paying for a veterinary medical education. Includes links to various resources. Colleges of Veterinary Medicine: Contains links to the admission requirements of the top professional veterinary programs. Veterinary Medicine Loan Repayment Program (VMLRP): Program that pays towards qualified educational loans of eligible veterinarians who agree to serve in NIFA designated veterinarian shortage situations for a period of three years. Veterinary Student Scholarships: A helpful list of national organizations, colleges, and states that sponsor valuable scholarships designed to help veterinary students pay for their college education. Occupational outlook handbook: Information on the job description, entry level requirements, and median salary for the primary healthcare professions. Occupational outlook for veterinarians: Detailed information about a professional career in veterinary medicine. WashingtonHealthcareCareers.com: Job hunting resources for pursuing a healthcare career in the state of Washington.